As a professional in an industry that unfortunately has many schools of thought as to training methodology, I have to be careful about the specific words I use when explaining behavior to non-positive reward based trainers. I hear from clients every single week that their dog is “aggressive” but when they describe the dog’s behavior, aggression is not the right label. So what IS aggression? Simply put, aggression is acting with the intent to harm. In the doggy world, there are many types of aggression, many different stages, and many different ways it manifests through behavior. What behaviors do not fall under the label of aggression? While talking with pet parents I hear many anecdotes of dogs jumping onto people, barking incessantly, stealing things off counters or pulling on clothes. Often times, the parents claim that their dog is aggressive because of these behaviors. All these behaviors, though very obnoxious and annoying, are not a matter of aggression but rather a lack of training. That jumping up or barking is likely your dog demanding some attention. Stealing food off the counters is just your dog learning that yum-yums live up there, if only they seek them out. Pulling on clothes or nipping is your puppy never learning what appropriate play with a human is. These behaviors have been reinforced (most likely on accident) by people, the environment, or both. I’ve read many sources stating that aggression is the most common behavioral issue and the number one reason people seek out training. I wouldn’t agree with this statement. That may be the reason someone is calling, but once a detailed behavioral issue is mapped out by the trainer, I usually find that this “aggression” is mis-labeled. Instead of aggression being the issue, it is generally a lack of training and impulse control. With that said, I don’t want to downplay actual aggression because it can be a huge issue. Aggression is one of the leading reasons why owners choose to euthanize. But out of all these cases, how many were mis-labeled? Simple training exercises can curb any of the previously stated behaviors and euthanasia doesn’t have to be an option. Also, knowing the stages of aggression and what they look like can help owners see the signs before it’s too late. I hear a lot of stories that start with “my dog bit so-and-so out of nowhere!” I guarantee there were plenty of warning signs beforehand that people missed simply because they didn’t know. Understanding doggy body language is the first step to noticing signs of aggression. Unfortunately, even though nearly 40% of households in the U.S. own a dog, a far smaller percentage actually understand key components of dog body language. There are many displays of escalating aggression, but there isn’t a specific order and some of these behaviors could be displayed for other non-aggressive reasons. These behaviors are meant to be warning signs, as your dog attempts to make the threatening stimulus go away. These behaviors will escalate if the stimulus keeps approaching. Your dog is communicating one of two things to the stimulus. The first is the offensive approach: “I am puny and mean you no harm, please just ignore me!” The second is the defensive approach: “I am one tough guy, you don’t want to mess with me!” Which one your dog uses is dependent upon the situation and his individual personality. Dogs have a vast array of warning signals to tell us (and other dogs) that a situation is making them uncomfortable. Some of the subtler signs are random yawning, avoiding eye contact, tail lowering in between the legs, or quick and small lip licks. More serious warnings may be deep and low growls, bared teeth, a hard stare with a closed mouth, stiff body language or a stiff tail. These are all ways that dogs tell a threatening stimulus to back off or go away. If the stimulus ignores these signs, what comes next could be air snaps or actual bites. Fear Aggression is probably the most misunderstood type of aggression. 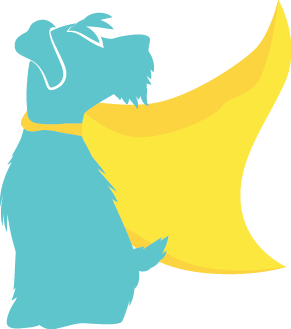 Dogs are responding to something in their environment that is making them uneasy or nervous. Dog-Dog Aggression is displayed towards other dogs. Dog-Human Aggression is towards people. These types of aggression may stem from inadequate socialization in puppyhood, a bad experience with another dog, or even abusive/aversive training methods. Possession Aggression or Resource Guarding is when a dog protects a resource from other animals or humans to keep it for himself. A resource can be food, toys, beds, a territory, a mate or whatever your dog finds valuable. Pain-Induced Aggression is a reaction to someone getting close to a site of pain, like when you attempt to move a dog when he is injured. If your dog is showing signs of pain and you try to examine the area, it’s a smart idea to protect yourself or even muzzle your pupper. 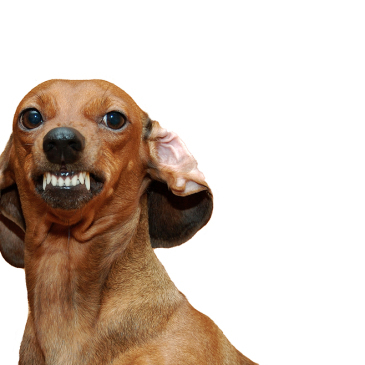 Predatory Aggression happens when dog’s predatory instincts kick in towards smaller animals. There may be some stalking followed by chasing of the prey. Once the prey is caught, harm to the point of death may occur. Redirection Aggression occurs when a dog redirects aggression onto a different source besides the original stimulus. If your dog is super worked up, be careful when approaching and definitely don’t try to touch them or grab a collar. They might redirect and bite you instead. Play Aggression occurs when an appropriate and healthy play session turns south for whatever reason. Compare this to a fight between kids on a playground. Something during play (maybe pain, or over-arousal) causes the dog to “drift” into a more predatory mode, thus being termed predatory drift. Training and reducing aggression depends on the type of aggression you are dealing with. I highly advise you to consult with a professional. DO NOT engage in any alpha rolling or other “dominance” training. I cannot state that enough. These training methods are obsolete and will cause the situation to escalate into more severe aggression. Remember, there will be lots of warning signs because your dog typically doesn’t want to engage in aggressive behavior. But if subjected to these scare tactics of “dominance” training, they will be pushed over that edge. Instead, recognize what is causing the aggression and either manage the environment or get your dog out of the situation.